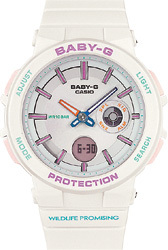 Starting from the end of the 1990s, G-SHOCK and BABY-G have been issuing special models in collaboration with and in support of various different environmental organizations. Now in 2019, we are pleased to announce our support for the activities of WILDLIFE PROMISING, an Authorized Nonprofit Corporation (NPO) that works towards coexistence between wildlife and humans in Africa. 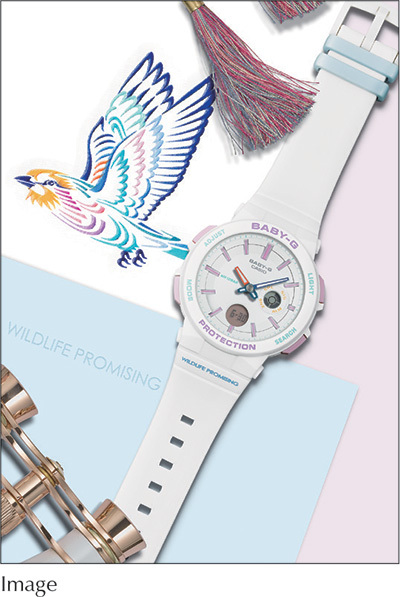 To mark the occasion we are releasing special collaboration models that were created in the spirit of maintaining a better living environment for both wildlife and humans. The design motif of this model is the lilac-breasted roller, a bird whose feathers are made up of 14 different colors. A bird of truly unforgettable beauty, the lilac-breasted roller is native to sub-Saharan Africa and the Arabian Peninsula, and is the national bird of Botswana. The basic white coloring of this model is accented by the 14 colors of the lilac-breasted roller. The index, hour and minute hands, band ring, buttons, and logos are done in a rainbow of different hues. Neon Illuminator uses a black light that causes face elements to glow for easy reading. Turning on illumination causes the hour and minute hands to glow in pink and green that add even more color to watch design. The band sports a "Love The Sea And The Earth" mark. The package of this model is decorated with a collage of photographs of African animals and an illustration of a lilac-breasted roller. WILDLIFE PROMISING is an Authorized Nonprofit Corporation (NPO) that works towards coexistence between wildlife and humans in Africa. It conducts conservation biological research from the viewpoint of the relationship between wild animals and humans in Kenya, with research focused upon the wild leopards that inhabit areas around Nairobi and the Masai Mara game reserve, and in northern Kenya. WILDLIFE PROMISING works towards better cohabitation between wild animals and humans through social and conservation activities based on its scholastic research.